This isn’t the first time I’ve heard this and every time the person has been wrong. The reason we will make you money. Even if money is all of you care about, you should care that we make our games better every day because that means that more kids will want to play them and more schools will want to buy them. 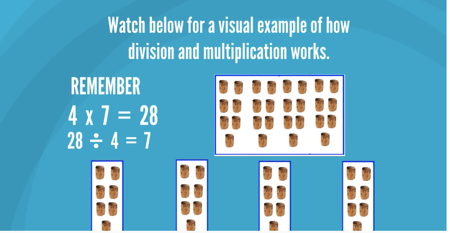 Take a look at at new and old screens from a video on teaching multiplication. Even cooler is the animation where the four parts of the image above split apart, which you can see in the video. Our old, “me-talking-over-a-powerpoint” videos worked to teach the concept and that was what we could afford to do given the time and budget available when we did our first game. 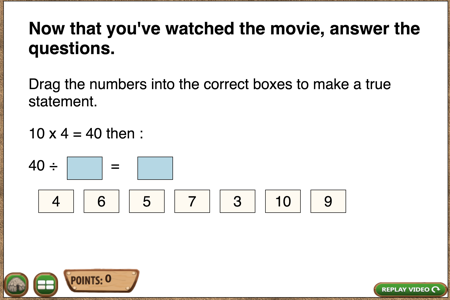 Here is one of the questions that replaced the old multiple choice items. By the way, creating this is not at all a simple programming problem to solve. That’s another post. 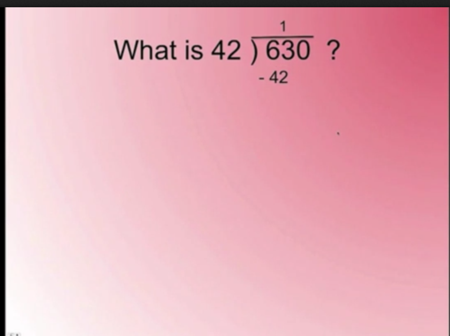 Here is a second problem after the same video. Why not just do multiple choice problems? They are WAY easier to program. The games would be done quicker and cheaper and everyone would make more money, right? What we’ve found through years of research is that minor changes like this add up. Maybe each change of dragging the numbers or clicking on the letters to unscramble them only make a game 0.3% more fun. However, when we make 100 changes like that in a game – and I am not exaggerating – it makes the games significantly more fun for kids and they are more likely to keep playing. No one ever learned from an application they didn’t use. It’s not an easy task, either. If it was easy, everyone would do it. That’s the other reason it matters how we make our games better. As an investor, you should worry that someone else could come in and undercut our costs, get a team of developers in some other country to create the games much cheaper. If we were doing a “Talk-over-powerpoint with multiple choice” type of game, that would be a concern. The coding we are doing is not developing new statistical techniques for data mining, but, on the other hand, it’s not “Hello World”, either. It takes better programmers to make better educational games, and we have been at it long enough, we’ve got a code library of modules to draw from. So, yeah, I will keep caring about how our games are made and maybe you should, too. This video is in Making Camp Premium, coming out this summer. 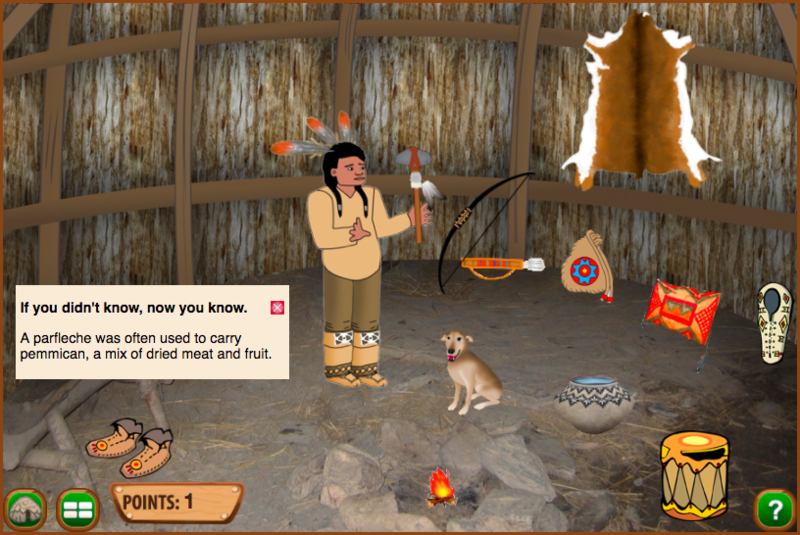 You can get the free version of Making Camp now.